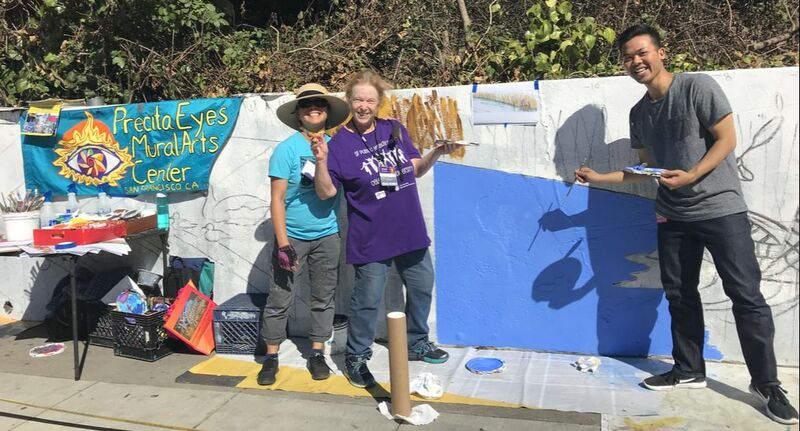 Designed and directed by Precita Eyes artists Elaine Chu and Yukako Ezoe, in collaboration with Laguna Honda Hospital patients and staff, the new mural invites us to re-envision the area's vibrant natural world and the lives of its original Ohlone Indian residents. the 200-foot mural completed in 2016 for the hospital's 150th anniversary. 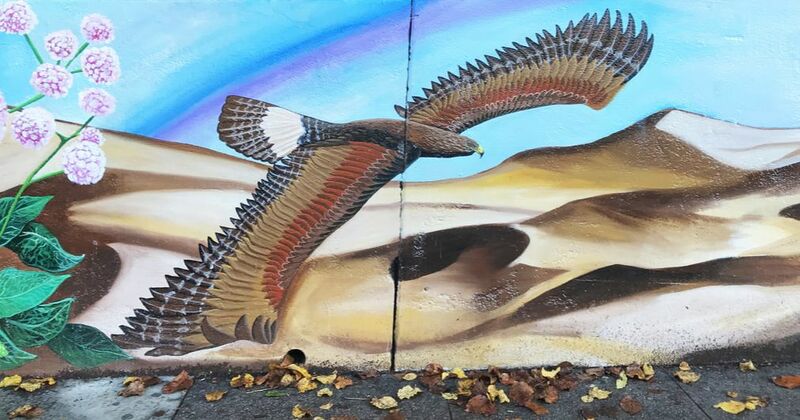 ​Volunteer artists give form to a Golden Eagle soaring over sand dunes; a Monarch butterfly feeds on milkweed; Humpback whales leap from SF Bay waters. More photos and mural details, here. 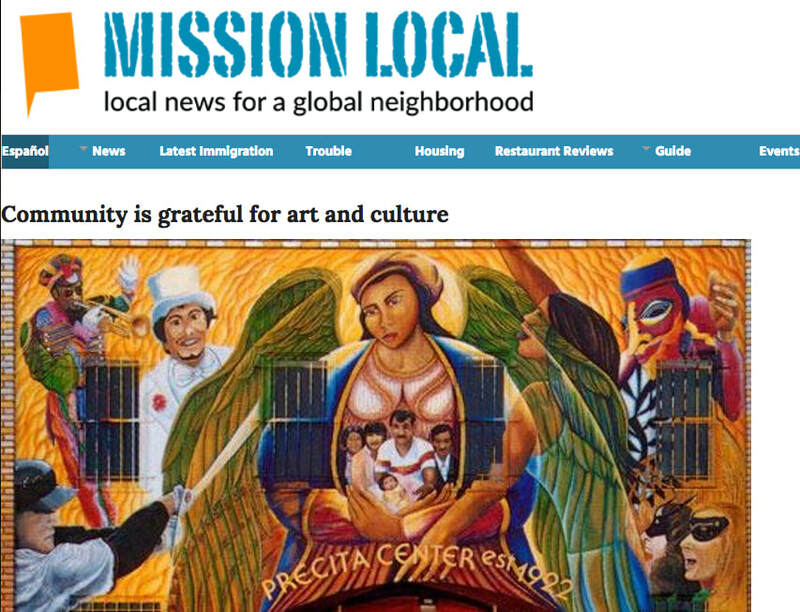 Precita Eyes Muralists Turns 40! 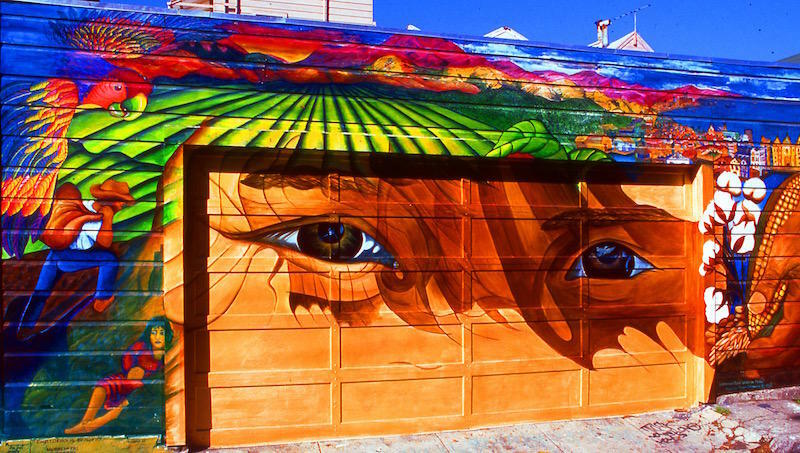 from Precita Eyes Muralists on Vimeo. 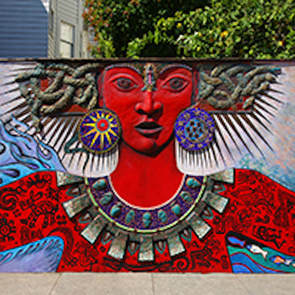 Forty years ago, Susan Cervantes and her husband Luis founded Precita Eyes Muralists in San Francisco's Mission District. Since then, Cervantes and Precita Eyes have helped create more than 400 murals throughout the city and beyond. Listen ﻿here﻿ to Cervantes' interview with KALW's Crosscurrents to learn how it all came about. 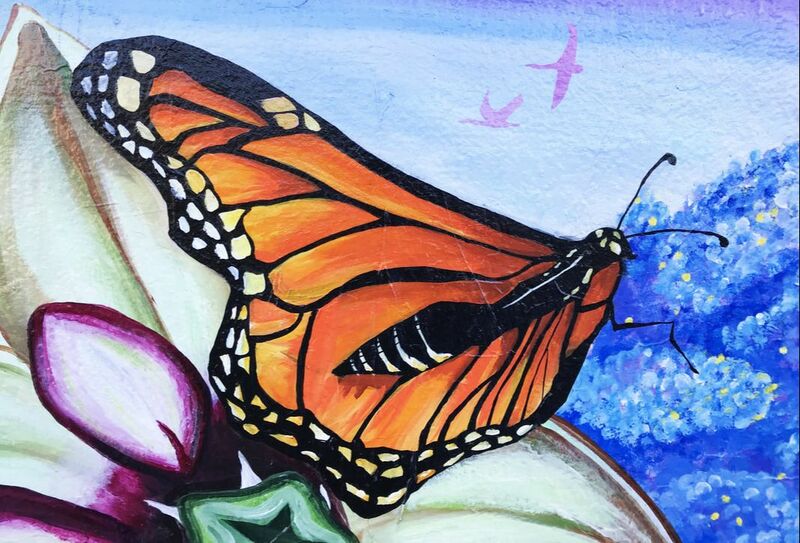 Precita Eyes Urban Youth Arts Program unveils its latest mural. The mural is a response to the pain of gang violence that has saddened this corner. Precita worked with artists who grew up here to create this tribute to those who have passed on. Directed by Max Marttila and Fred Alvarado, with Ramiro Guillermo, Guillermo, George Crampton and Paul de Costa. Funded by a California Creative Communities grant from the California Arts Council. New exhibition at the JCCSF looks at neighborhood identity through public art. Having a blast celebrating our 40th anniversary gala! Thanks to all who accompanied us. ​More photos here. at City Hall on Monday Sept 26. 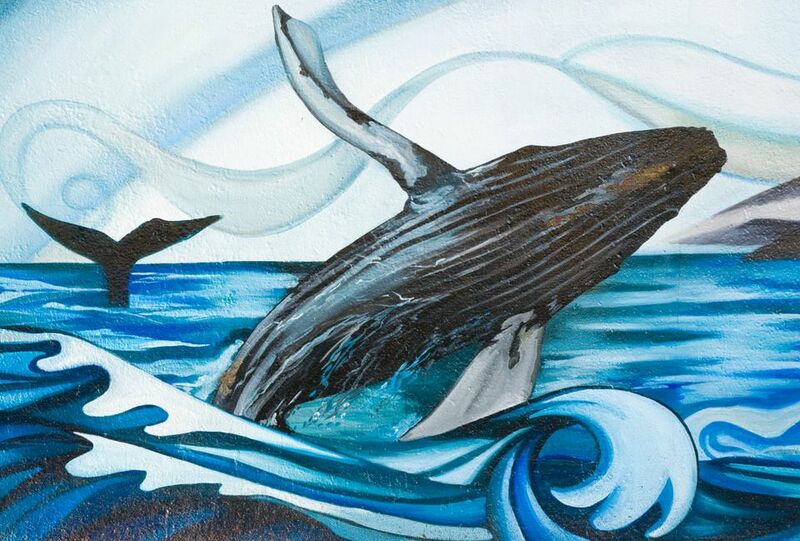 ​"For almost 40 years," the citations states, "Precita Eyes has been committed to enriching communities through collaborative murals that celebrate culture, unity, history, and nature. From affordable youth arts education programs to preserving and restoring the city's treasured public art relics, Precita Eyes is dedicated to using self-expression as a tool for positive social change." 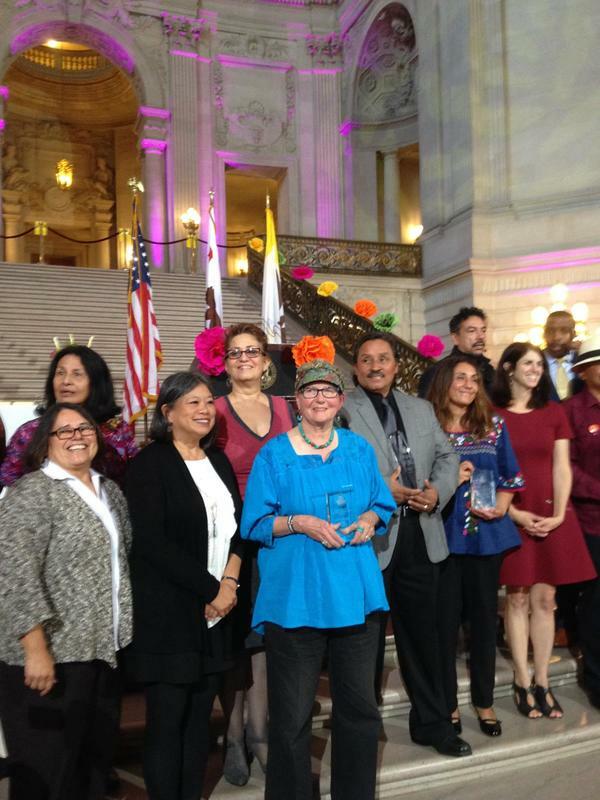 In the photos, Susan with the award; with lifetime achievement winner Arturo Carillo; with Jennie Rodriguez of the Mission Cultural Center for Latino Arts (also a legacy category winner) and Supervisor Hillary Ronen; and with other prize winners. A Prize for Precita Eyes! 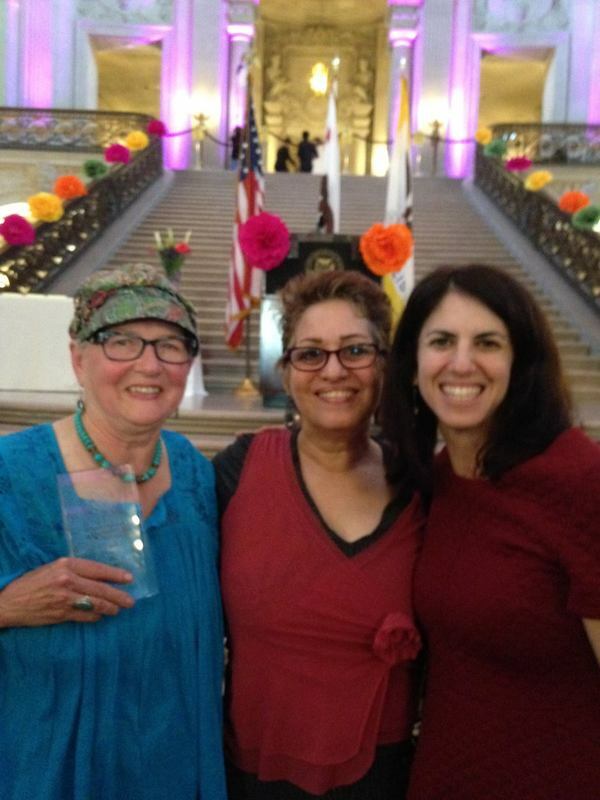 On Sept 15, Precita Eyes Muralists was honored with the San Francisco Symphony's annual Ellen Magnin Newman Award for outstanding community service in arts education. 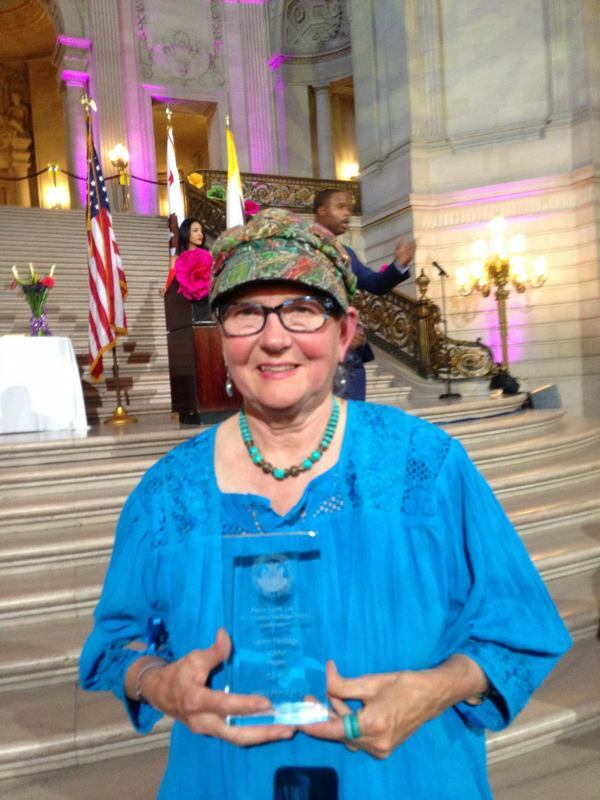 Precita founder/director Susan Cervantes accepted the plaque, which highlights its "commitment to bringing art into the daily lives of people through a process which allows them to celebrate their beauty, discover their creativity, and reflect their concerns, joys and triumphs in a unifying way." 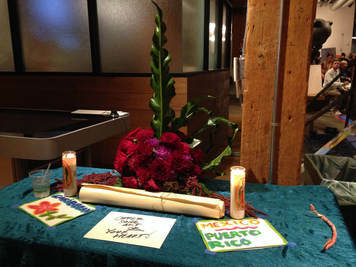 The ceremony took place at the "All San Francisco" community concert that inaugurates the SF symphony season, and highlighted Precita's 40th anniversary this year, and its "Collaborative Art: Celebrating Creativity in the Community" gala on Sept. 30. Susan Cervantes displays the plaque. Cervantes with SFS award committee co-chairs Sarah Cohan and Erik Auerbach. 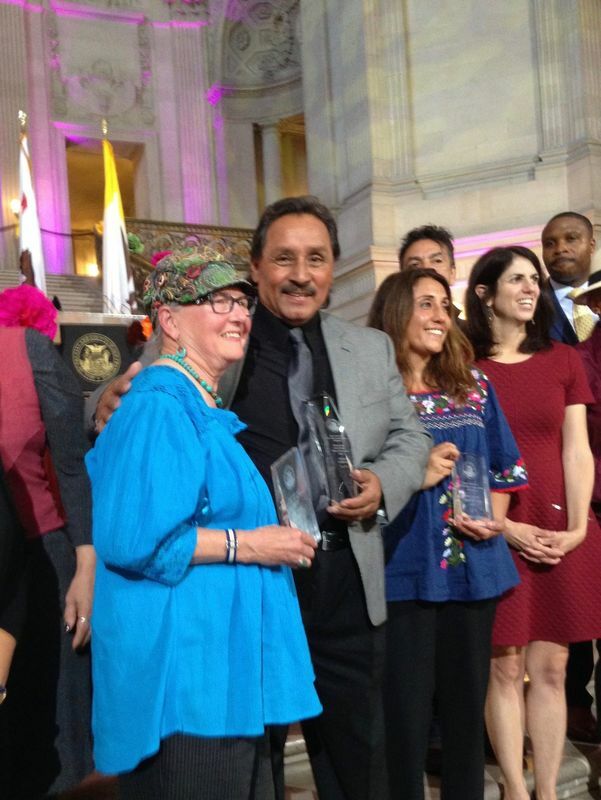 40 years ago Susan Cervantes and her husband Luis founded Precita Eyes Muralists in San Francisco's Mission District. These days, it’s impossible to walk around the Mission without running into a mural. But that wasn’t always the case. Originally inspired by the Mujeres Muralistas, a pioneering women’s muralist collective based in the neighborhood, Cervantes and Precita Eyes have helped create more than 400 murals throughout the city and beyond. CERVANTES: It wasn't hard for me to imagine, or even to think big because I always painted very big. And what I liked about it was it was for the people. Precita Eyes holds its first-ever Street Art in Cinema Film Festival at the Grand Theater in San Francisco on Saturday, June 17th. You can also join Cervantes on a special anniversary mural history tour around the Mission on Saturday, June 17th and every third Saturday through September. The Mission Economic Development Agency has purchased a building on Precita Avenue, which houses the first location of the Precita Eyes Muralists as well as four rent-controlled tenants. The $1.35 million deal will keep both tenants and muralists in place at affordable rents. Moreover, MEDA staff say they have developed a new funding mechanism – raising money from neighbors – to act faster in future acquisition.